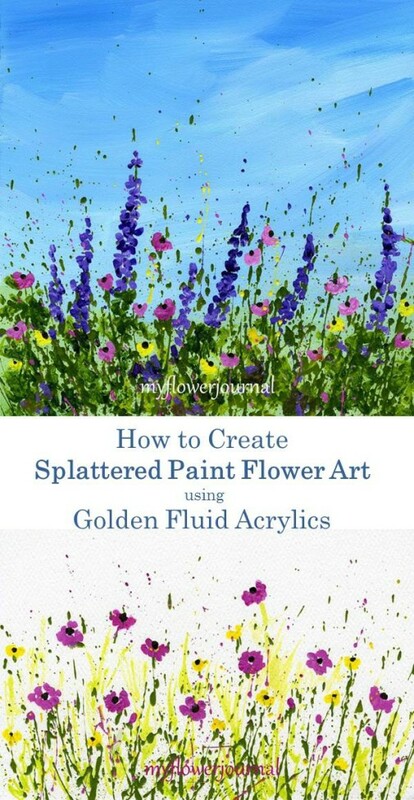 The Splattered Paint Flower Art I’m sharing today was all created with Golden Fluid Acrylics. A question I am asked often is what type of acrylic paint I use. 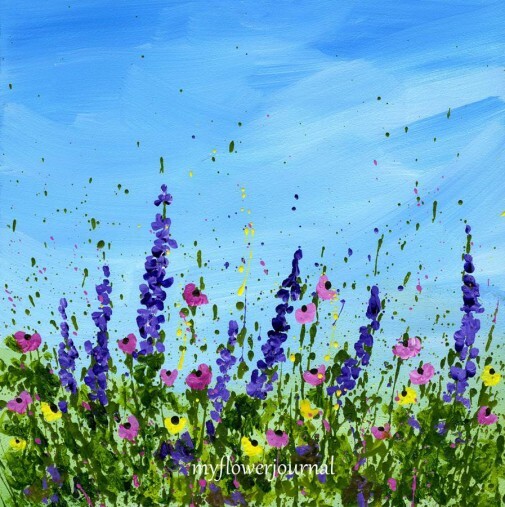 I have used a lot of different brands of acrylic paints over the years for my splattered paint flower art. Sometimes I use a variety of brands in one painting. The most important thing to look for is a fluid acrylic paint, not acrylic paint in a tube. 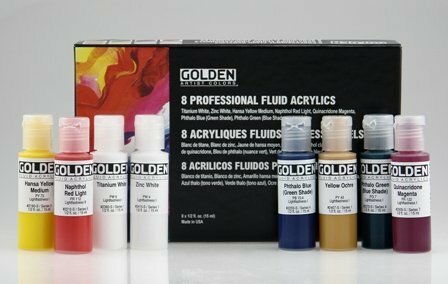 Golden Fluid Acrylic paint is the most expensive brand I use. Other less expensive brands work as well, but Golden’s intense colors can’t compare to most other brands. 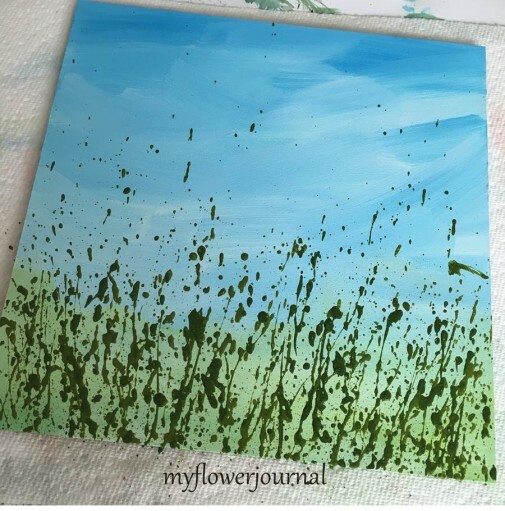 The three splattered paint flower art pieces in this post were made with the Golden Fluid Acrylics. I painted them on gesso board or watercolor postcards. I use the colors in this basic set and Ultramarine Blue, Cobalt Teal, Sap Green, Green Gold, Dioxazine Purple, Raw Umber. With these colors I can mix most colors I need for my flower art. After I paint the sky and ground color I splatter green paint with a round bristle brush. You can watch a video and learn more about how I do this here. After the paint has dried I add dabs of flower colors to create a variety of flowers. If I have splatters I don’t like I can cover them with flowers. I keep adding flowers and sometimes more greens and a few splatters in the flower colors. After it dried for a day I sprayed it with Golden Matte Varnish to protect it. Tammy your posts are always so beautiful! Really beautiful, fresh and happy paintings! Interesting post about the type of acrylic paints you use. I’ve heard of Golden a lot but have never used them. I like Lukas as they also come in bottles and are very fluid. 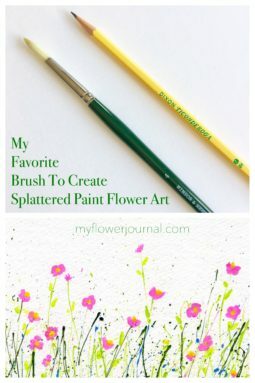 Lovely paint spatter flowers. Your paintings are so bright and full of life. Thank you for sharing your process. Such gorgeous paintings…you are so talented!! Love the free and splattered look of your flowers what fun they are. This is lovely and interesting process — I enjoy the rich paint colors as well! This is so clever and you’ve got a great result. I expect it is more difficult than it looks. Interesting to read your choices of the paint colours too. Found you through The Scoop. 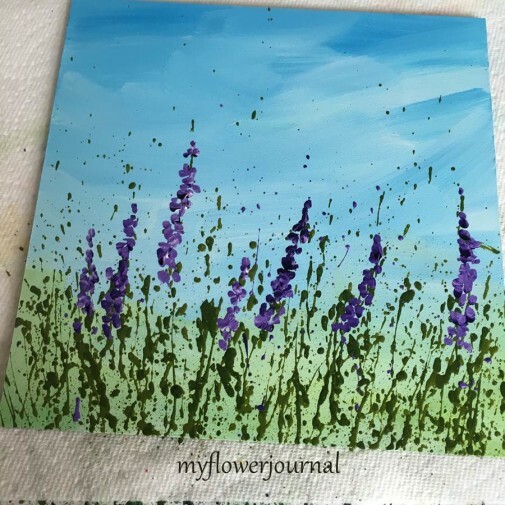 Love your work, reminds me of spring and love your paint technique! So pretty! Thank you so much for sharing the steps in recreating this beautiful painting. For some reason I can’t get that splattered long look???? I tried the same garage golden acrylics and watercolor same brush ?